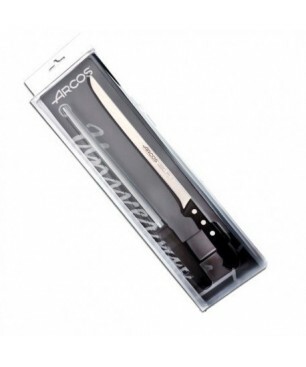 Arcos Slicing Knife natura. Comfortable and elegant design. The Arcos Slicing Knife natura is an excellent knife for ham lovers, it is a suitable knife to cut all kinds of hams and shoulders. 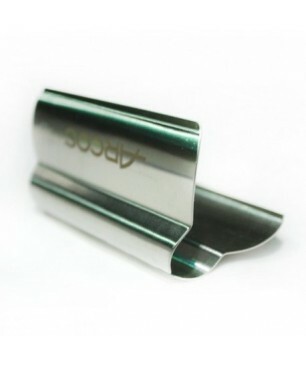 The design of this slicing knife makes it elegant, suitable and comfortable. The handle is made of rosewood, furthermore it also has a long and flexible blade made of Stainless Steel NITRUM, perfect for getting thin and long slices. 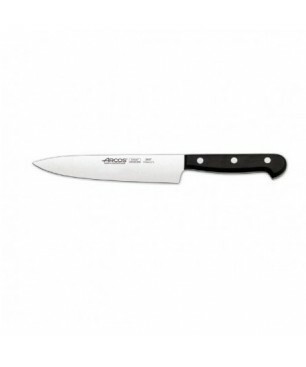 Because of its forging fornitura one piece knives are highly demanded by professional chefs. The blade is forged stainless steel NITRUM ®, to improve their qualities. 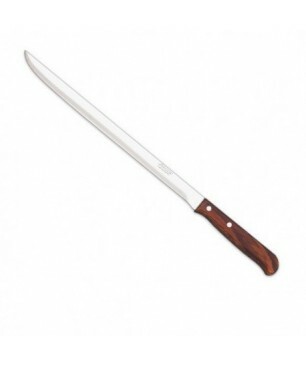 Classic cut handle with a rounded finish of great beauty and great firmness in use. Stainless steel rivets, ensuring high corrosion resistance. 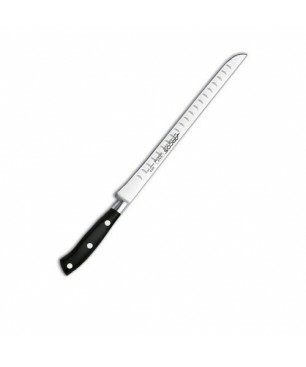 The Arcos Slicing Knife riviera blanc is an excellent knife for ham lovers, it is a suitable knife to cut all kinds of hams and shoulders. 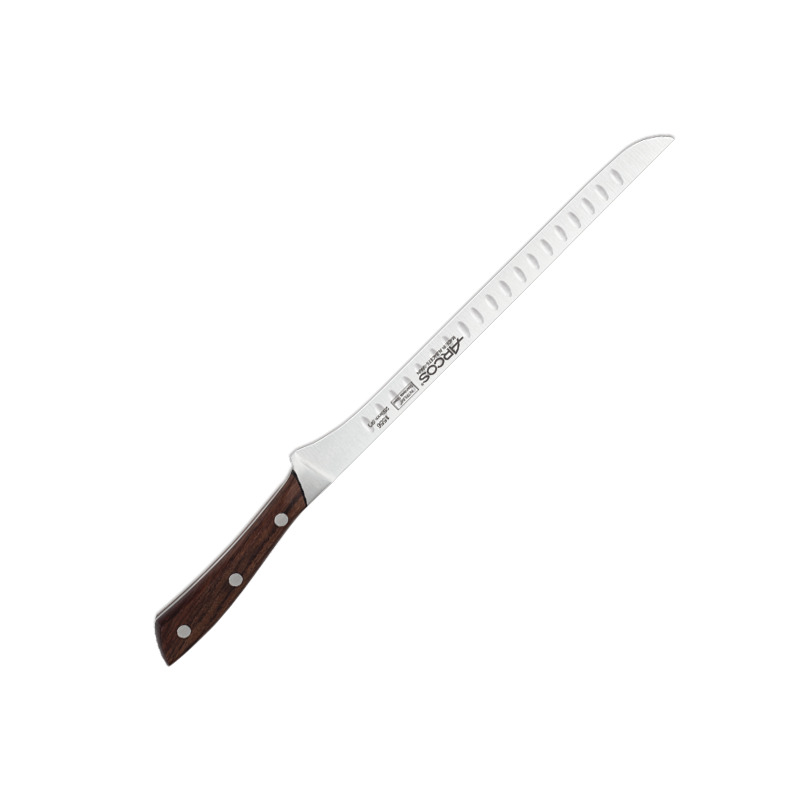 The design of this slicing knife makes it elegant, suitable and confortable. The handle is made of polyoxymethylene (POM), furthermore the blade is made of Stainless Steel Forged NITRUM with bacterial protection system. Slicing knife "rustic". 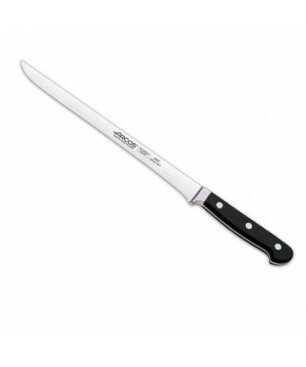 An ideal knife for cutting the ham, long and flexible to get very thin and long slices. 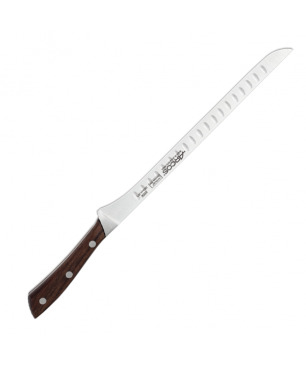 It glides over the ham.Wooden handle.You must be sharpened often to maintain a precise and easy. 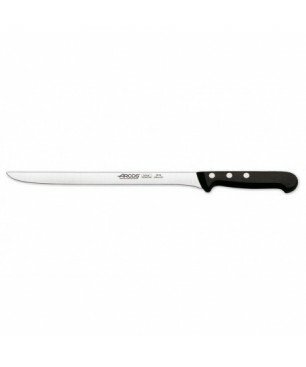 Arcos Cook knife Nitrum Serie Clasica 210mm. The blade is forged stainless steel NITRUM ®, to improve their qualities. Mangos Classic cut with a rounded finish of great beauty and great firmness in use. Stainless steel rivets, ensuring high corrosion resistance. 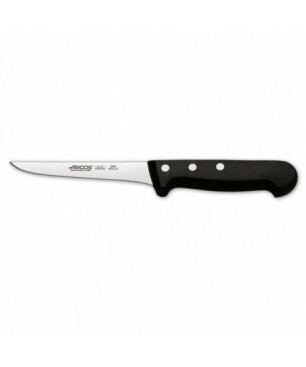 The Arcos cheese knife is the perfect knife to cut cheese wedges. Its design allows you to cut the cheese into thin sheets, its design avoids the sticking to the knife and the breakage of the cheese. 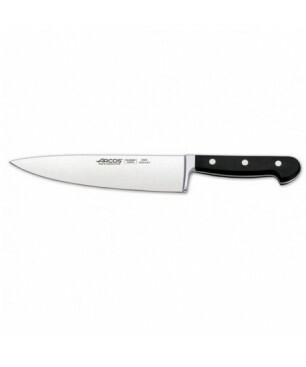 Cutting cheese is easier than ever with the Arcos Cheese Knife. 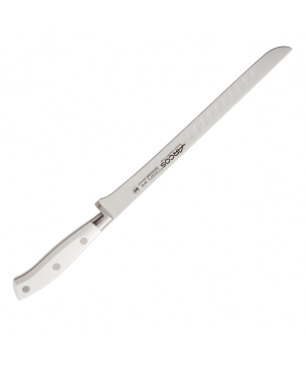 Arcos ham peeling knife Nitrum Serie Unirversal 170mm. Exclusive stainless steel high-performance and durability NITRUM ®. Handle designed for daily use without losing the design, dominated by straight lines with large formal and color contrasts. Stainless Steel Rivets tongued, high strength. 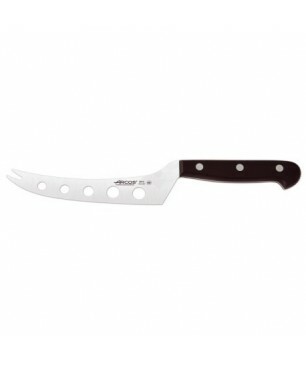 Arcos knife Nitrum Serie Unirversal 130mm. Exclusive stainless steel high-performance and durability NITRUM ®. Handle designed for daily use without losing the design, dominated by straight lines with large formal and color contrasts. Stainless Steel Rivets tongued, high strength. 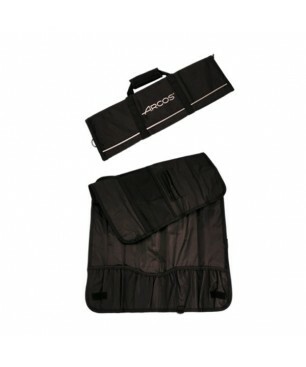 Arcos bag holder for 8 knives Bag to transport 8 knives safely to avoid cuts and to avoid damaging the knife blades. Space for 8 knives and additional material. Carrying handle. Stainless steel tweezers Arcos for sliced ham and sausages. These stainless steel tweezers Arcos serve to serve the sausage and sliced ham. In the cutting process used to distribute the ham sliced ham on the plate as desired. They can be washed in the dishwasher. 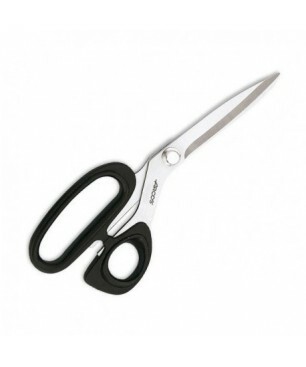 Kitchen scissors Arcos 210mm. Kitchen scissors are designed so that the axis of rotation is away from the handles in order to provide maximum strength to the cut. The handles come in varied forms and are manufactured from stainless steel or plastic.